Lagavulin has partnered with award-winning actor Nick Offerman to create a Scotch whisky tribute to America’s iconic Yule Log broadcast. Nick Offerman contemplates his Lagavulin for a good 45 minutes. The 45-minute video has been produced to celebrate the 49th anniversary of the original Yule Log programme, created in 1966 by Tribune Broadcasting Station WPIX. The original and now iconic programme, which is broadcast on Christmas Eve or Christmas Day morning for two to three hours, is a film loop of a traditional roaring fire with festive music playing in the background. However Lagavulin and Offerman’s version features the Parks and Recreations actor and winner of the Television Critics Association Award for individual achievement in comedy, sat in silence for the best part of an hour sipping a glass of Lagavulin 16 Year Old by a fireplace. ‘You might be surprised by the calming effect my Scotch-inspired contemplation will have upon your digestion of holiday meats,’ Offerman said of the video. 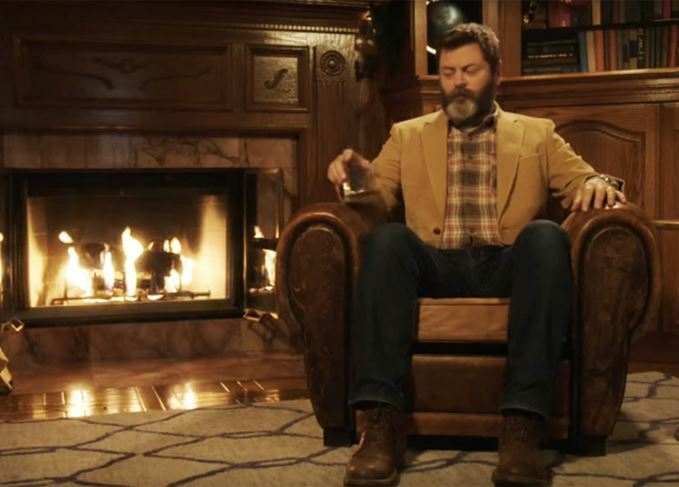 Diageo, owner of the Lagavulin brand, and Offerman are now requesting video streaming industries replace their traditional Yule Log broadcast with their own version every evening between 10-11pm throughout the holiday season. Other parodies of Yule Log have been produced in the past, including a Disney-themed fireside, one featuring a cute cat with tongue retraction issues, and another by songwriter Michael Bublé playing a half-hour runthrough of his Christmas album.